As three separate migrant caravans make their way to the US-Mexico border, the Customs and Border Patrol officers were helped by soldiers who placed about 1,000 feet of additional fencing along the Rio Grande. 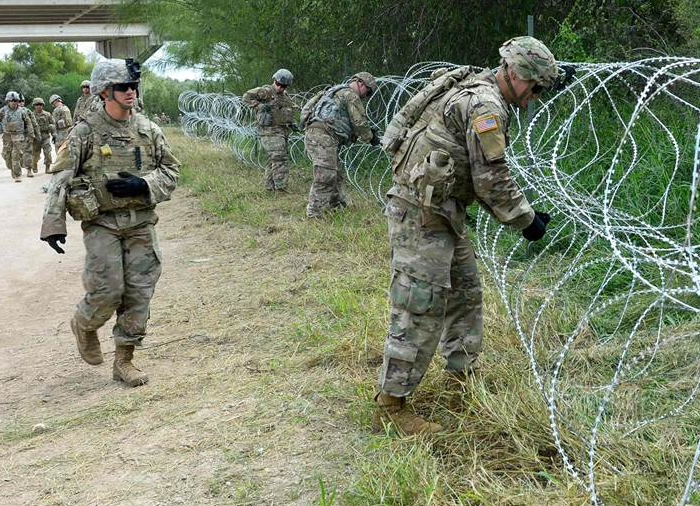 The troops also laid down barbed wire along the border. The fencing and barbed wire barrier got placed underneath the McAllen-Hidalgo International Bridge, which crosses into Mexico (the precaution was taken as more video showed the migrant caravans crossing rivers to get from Guatemala into Mexico). Mr. Chris Cabrera, border patrol agent was glad the troops had arrived, stating his unit had needed help "for some time," but still thought the problem would not be immediately resolved. "You can put them shoulder to shoulder from Brownsville to San Diego. All they got to do is put one foot on land and say I need asylum and we're still in the same position." "As far as border patrol agents, I think we're going to continue doing what we do," Mr. Cabrera stated. "Obviously if we can get some more manpower, that'll help out but we are going to continue to operate like we do because we're used to doing more with less." The US Department of Defence has not yet commented on POTUS’s claim that the 5,000 active-duty troops as part of Operation Faithful Patriot would soon be boosted from 10,000 to 15,000. A Border Patrol spokesman explained that the fencing and barbed wire was simply part of “necessary preparations” for the caravans. Meanwhile, the largest caravan of migrants could be seen continuing on foot trying to reach Mexico City. On Saturday afternoon they were spotted going through Sayula in the Gulf Coast state of Veracruz, still some 750 miles from the US border. Some 3,000 of them have already applied for asylum in Mexico whilst hundreds of others have decided to return home. At this moment, there are still some 4,000 remaining. The second caravan, of some 1,500 people, entered Mexico in a violent manner last week (some of them could be seen throwing rocks at the Mexican police) and could be seen some 1,000 miles from the US border. Lastly, a similar-sized caravan could be seen crossing the Suchiate River from Guatemala into Mexico. Let's bring back the flamethrower, issue one to every soldier & guardsman! I`m Mexican, yet I`m tired of these lazy welfare bums & gangbanging youths F-ing up the good rep of us legal hard working Americans of Hispanic descent!